Socket Mobile DuraScan D600 Contactless NFC HF RFID Reader/Writer - Fast NFC & RFID Reader (HF tags, labels, smart devices) HF RFID Tags Supported are ISO15693: ICode SL2, LRI512, my-d, Tag-It HF-I HF RFID Tags. Made for iOS, Android, or Windows® devices with Bluetooth LE. Ergonomic, Elegant and Rugged ! Built for harsh environments in warehouse, distribution and industrial manufacturing. Stylish enough to be showcased in boutique retail environments. 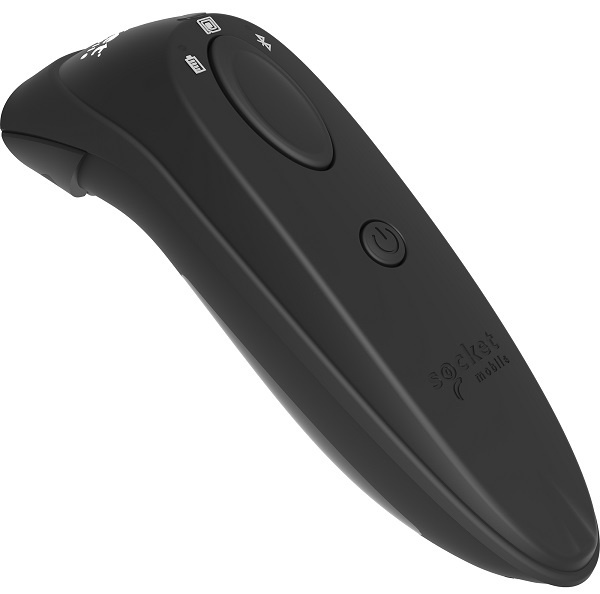 The DuraScan® Model D600 Contactless Reader/Writer features great ergonomics fitting perfectly in your hand for comfortable and extended use. Light and small enough to fit in your pocket. Designed for mobility and wireless reading/writing with Bluetooth® connection up to 330ft (100 meters). •	Reading – Fast NFC & RFID Reader (HF tags, labels, smart devices). •	Writing – Write/Encode, lock, unlock tags and communicate peer-to-peer with smart devices. •	Exceptional Reading Ability - reads small tags, hard-to-reach tags, tags surrounded by metal or human skin. •	Exceptional Ergonomics – Small, light and fits perfectly in the hand (with or without gloves on) for comfortable use over extended periods of time. •	Long Lasting Battery - Power to last for two 8-hour shifts. •	User Feedback - Intuitive LED indicators and melodies let users monitor battery, Bluetooth connection and scanning status at a glance. •	Rugged Design – Protection rating of IP54 for dust and water splashing protection. Withstands multiple drops to concrete and repeated tumbles. •	Protective Material - Made with antimicrobial additives to help protect against harmful bacteria. •	Basic Mode (default) - No software installation required when using the NFC/RFID Reader & Writer in Bluetooth HID mode. •	Application Mode - Improves business productivity with faster, efficient and reliable data transfer, leveraging functionality by integrating Socket Mobile’s SDK in your app. •	Wireless (Bluetooth) - Reading for iOS, Android and Windows mobile devices with long-range Bluetooth connection of 330 feet (100m). Uses Bluetooth low energy 4.2 with Privacy and Security Enhancements. •	Wearable - Includes lanyard/ belt clip for convenient access wherever you go. Note: Battery life varies depending on ambient temperature, read attempts, and age of battery. Bluetooth Profiles: Basic Mode – HID (Human Interface Device) Keyboard Emulation. Application Mode – RDR (RFID Reader only) and PC/SC (for Read & Write) enabled by the SDK. *Basic Mode is the Factory Reset (default) Bluetooth profile.